A symbolic photo taken of the triple-agent blaspheming ladies man and defrocked priest, Malachi Martin, on 23rd June 1996 in front of painting of the Twin Towers in New York City, New York. Malachi Brendan Fitzmaurice-Martin was a defrocked Jesuit priest who left the Jesuit Order because they weren’t modernist enough for his taste and he had a predilection for affairs. He sold his blather to everyone including the rabbis (whom he relished exchanging jokes with in Yiddish) that employed him at the Second Vatican Council. A Judaic agent who sold his services to the highest bidder. His work, done with malicious joy, under Cardinal Bea and the liberal faction leading up to and at Vatican II was blackmailing conservative cardinals with long-closeted skeletons. Martin received fellowships not once but twice from the Guggenheim foundation to extol the Judaizing of the Church. A conman extraordinaire who fooled gullible Catholics with storybook depictions of Black Masses in St. Peter’s Basilica and unbelievable tales of exorcisms. Martin claimed to be anything and everything depending on his audiences from John XXIII’s confessor to being a ‘secret’ bishop. 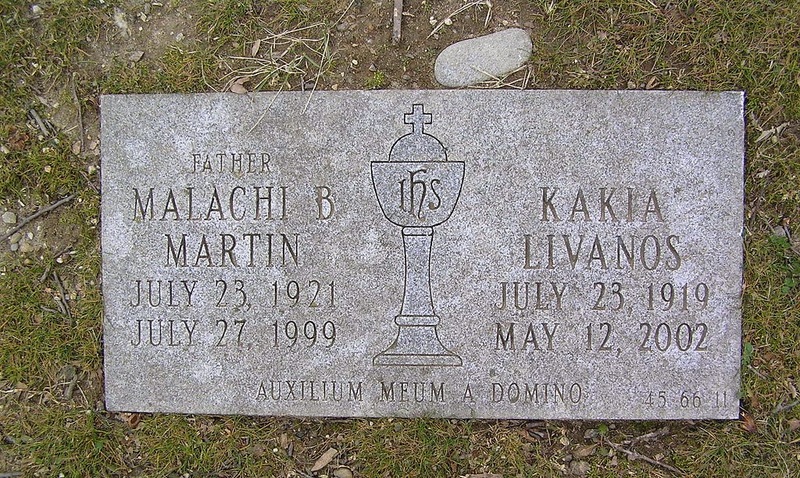 On occasion the true Malachi would revel himself in interviews where he blasphemed Our Lord Jesus the Christ and stated he had, “done more for Catholic-Jewish relations than most people alive.” If nothing else, Martin was an occult trickster. How sad that people take seriously this flim-flam man who peddled snake oil and lies. Fake John XXIII prayer written by Malachi Martin surfaces again. Who is receiving the residuals from this prayer? — Malachi Martin writing under the pseudonym F.E. Cartus in Commentary fabricates the fraudulent prayer, which he claims John XXIII authored, for his Talmudic Jewish paymasters. Voris borrows latest excuse from Malachi Martin — Michael Voris borrows Malachi Martin’s “superforce” excuse and applies it to the papacy of Francis. Voris sells this pablum to listeners of his Vortex show and on his Church Militant website. The “superforce” excuse is simply thus, the pope is a good man who is fighting the evil bishops who surround him, so don’t complain about the pope. Stay loyal to him. more on the trickster Malachi Martin — An excerpt from the book, Hothouse: The Art of Survival and the Survival of Art at America's Most Celebrated Publishing House, Farrar, Straus, and Giroux, concerning Malachi Martin’s backstage machinations at the Second Vatican Council, his sympathy to the Talmudic Jewish religion, Martin is compared to the heretical Pierre Teilhard de Chardin, the Guggenheim connection, and how his love affair with Kakia Livanos began. slippery as a snake, Malachi Martin — Mentions of Malachi Martin in the Rev. Hans Kung’s memoir, My Struggle for Freedom, as the writer of The Pilgrim under the pseudonym Michael Serafian. One of Martin’s theses in The Pilgrim was that Roman Catholicism was in need of reform or fixing because an integral part of Catholicism was antisemitism which had led ultimately to Auschwitz. the ladies' man, Malachi Martin — An excerpt form the biography, Queen of the Oil Club: The Intrepid Wanda Jablonski and the Power of Information, corroborates multiple sources on Malachi Martin’s affair with Wanda Jablonski in 1972. 'apostate' Fr. 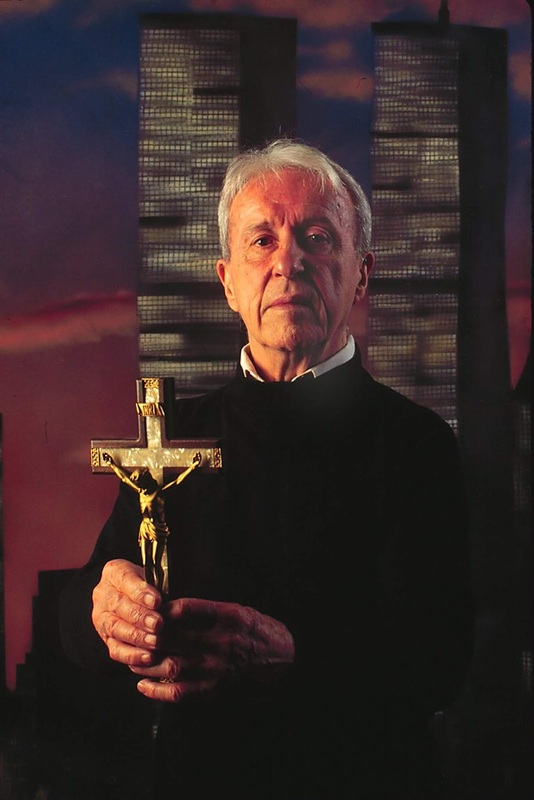 Malachi Martin helps break up a marriage — Two letters concerning Fr. Malachi Martin’s affair with Mrs. Susan Kaiser which began in 1963. In the first Fr. John Courtney Murray S.J. mentions the love letters Fr. Martin wrote to Sue Kaiser. The second from Fr. William Van Etten Casey to Archbishop H. E. Cardinal advocates for an annulment of the Kaiser’s marriage and mentions Fr. Martin’s role. 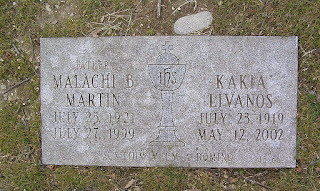 another mention of the 'defrocked' Malachi Martin — In Queer Street: Rise and Fall of an American Culture, 1947-1985, Malachi Martin is described as being “a single serpentine, drunken defrocked Irish Jesuit priest” in the Fifth Avenue salon of Kakia Livanos who told visitors he was the confessor for John XXIII. Nostra Aetate and Malachi Martin — Excerpt from The Power and the Glory which explains the role Malachi Martin played in helping Cardinal Bea draft the Second Vatican Council’s Nostra Aetate. 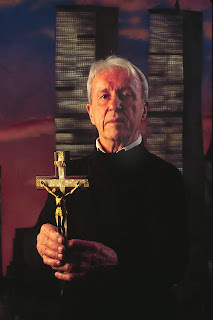 Malachi Martin blasphemes Jesus the Christ — In an interview conducted in 1996 by Bernard Janzen at Malachi Martin’s home, Martin says Roman soldiers sodomized Our Lord. More blasphemous heresies from the lips of the forked tongue deceiver — Malachi Martin — On William F. Buckley’s Firing Line, Malachi Martin tells listeners that God could have incardinated as a cow and that two of the Catholic Church’s deficiencies are lack of women and a theology of love. Malachi Martin would be proud — ‘Artist’ Tom Herck shows what Malachi Martin’s ‘God incarnated in a cow’ looks like in his artwork ‘Holy Cow’. Malachi Martin the Kabbalist — This post quotes the supposed traditional Catholic stating that God acts through Kabbalists and later Malachi Martin praises the rabbis for using Gematria. Martin tells one to use caution in expounding these “magnificent themes” to Roman Catholic audiences. Malachi Martin was named after an Iberian Jewish banker ancestor — This post quotes from and has the entirety of an interview-article conducted by Ben L. Kaufman for The Cincinnati Enquirer with Malachi Martin as he promotes his book, The New Castle: Reaching for the Ultimate. In it one reads that Mr. Martin was laicized, named after an Iberian Jewish banker-refugee ancestor, and more. Before Malachi Martin was laicized, he relished shaking down conservative cardinals at Vatican II — Ben L. Kaufman for The Cincinnati Enquirer interviews Malachi Martin about his life and book, Jesus Now: How Jesus Has No Past Will Not Come Again and In Loving Action Is Dissolving the Mold of Our Spent Society. This entry contains several bombshells the biggest of which is that Martin worked for the liberals at the Second Vatican Council and was instrumental through blackmail in getting much of the un-Catholic and horribly evil agendas passed at the Council. Vatican II Kabbalist Sage, Rabbi Abraham Heschel: "I Want to Attack Their Souls"
Malachi Martin: "God Could Have Incarnated as a Cow;" "Priests Should Have Been Female"
Mgr. Oesterreicher on Malachi Martin and the Fraudulent "Prayer for 'The Jews"
two electors of Pope Linus II. When describing Christ's passion, he said he "bled like a pig". That's Talmud talk. No proper Priest would speak about Christ in that way. Thank you for bringing this information together on one page online. Dr. Martin was a virtuoso con man; a triple agent on par with H.A.R. “Kim” Philby. Here was a flaming rabbinic change agent operating at the top of the Vatican hierarchy who successfully disguised himself as a traditional Catholic. The repercussions from his fraud continue even now. Mr Hoffman, you are right! I know of someone who interviewed Dr. Martin, swore by him. He has a complete set of interviews for sale. Now I understand how this same person claims the Church is Anti-Semitic. I am looking forward to more information. Wow. Thank you for opening my eyes. Sedevacantism leads to the absurd, because it considers that only they are the Catholic Church. Then, they must choose a "Pope." On the other hand, in the sedevacantist world, including sedeprivationists headquarters, there is total disunity and much disaster. 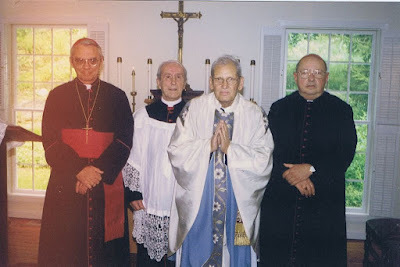 The theology on the papacy of FSSPX is not correct. It is a derivation of Gallicanism. On the other hand, not everyone in the "Conciliar Church" is lost. Are they not the Church by system? After 2VC the Church has been brought into chaos. 2: In Sedevacantism, there is not total disunity and disaster as you point. The CMRI and the SSPV are not divided because of Doctrine, but because of some misunderstanding on the validity of the orders. But you go with anyone of them and they will tell you the same Doctrine of the Church. Besides, in the novus ordo sect you go to one parish and they give communion in the hand and drag-queen masses. One another parish they give you communion in the hand but sell pro-life magazines. And in other parishes, they have indult masses with an image of Karol Wojtyla. Their "union" is only by word. 3: The reason of sedevacantism resides in the fact that the Church must not give evil to the people. This is what Jesus Christ said when he said: "And I say to thee: That thou art Peter; and upon this rock I will build my Church, and the gates of Hell shall not prevail against it.". If the Church is giving false encyclicals, false saints, false sacraments, false doctrine - in one word, evil - this means that now satan has toppled over the Church. In the other hand, according to Pope Virgilius at the Second Council of Constantinople, called the gates of hell the "tongues of heretics". If now we see VII Nopes saying heresies, that means that they can not possibly be the Popes of the Catholic Church. 3: It is not absurd that we consider that only we are the Catholic Church. If only a small group of people keep the faith, those people are the Church. 4: What is the "Church by system" ¿What we have is a system or a Church? 5: It is important that people research before speaking. I recommend you to do your own research. Long Life Christ the King and Our Lady of Guadalupe. The fact that these people are fooled by Malachi, talks a lot about them. Because they only notice the disasters of the Novus Ordo. But what about theirs? Without a doubt, the "solution" is worse than the problem. I said that disasters are not only among the people of Novus Ordo. There are also between sedevacantistas. There are some that are true sects. I see many reasonable people in Novus Ordo. They do not believe in what Francis teaches. But they fear forming a sect. I do not think Francis is the Pope. Nor Benedict XVI. Also among sedevacantists and the people of FSSPX I've seen reasonable people. But Urbina, López, Coomaraswamy have nothing to tell me. 1: Good that you do not think Benn and Frank are Popes. I am really surprised.... but it can be true! Looking for more evidencies! Greg Burke & Paloma García Ovejero resign! When the Nativity of Our Lord just isn’t enough!